A Born and Raised Florida Girl with a Passion, a Laptop and a dream, I am honored to work in an industry where I can help people to experience joy, nostalgia, and escape through music. Through digital DJ services, customized performances, thoughtful song selection, and community education, I help people like you experience the joy of music when attending a DJ Shannon C event. For as long as I can remember, I’ve been completely in love with music. My grandmother started me on the piano at 5, and by 7 I could sit down and play songs I would hear on the radio. My musical ear was always very strong. I always gravitated to musical instruments, so it was no surprise that by age 12, I was the lead flutist in my middle school orchestra, and by 16, a lead trombonist in our high school symphony and jazz ensembles. I’ve always gravitated to drums and percussive instruments, experimenting with side rock and ska projects in high school. I also wrote musical arrangements for our 100 piece high school marching band. Like I said, I was IN LOVE with Music. After USF, I hopped around between jobs, aggressively climbing the corporate ladder in a Training and Project Management capacity. I’ve trained for major companies including Medicare, Capital One, and JP Morgan Chase. And while I was very good at my job, a large part of me was very unfulfilled. I had been hosting Bar Trivia as a side job to allow me a sense of creativity. I was back in school studying Adult Education, and I was heavily pursuing a corporate career. Everything changed because I sustained several injuries to my body and my brain. Everything changed because I could no longer work a corporate job as I had to be in physical therapy 5 days a week. Everything changed because I was in a position where I had to completely rebuild my life. On March 1st I was rear ended by a Semi Truck while stopped at a stoplight. And everything changed. The brain injury that I sustained impacted my motor functions. One day I sat down at my piano, which had also been an emotional outlet for me, and I couldn’t play. My fingers wouldn’t move to the keys liked they’d been trained for years before. This through me into a deep depression. In an attempt to help me feel better, my then boyfriend showed me some basics of Djing and put a mixtrack pro with virtual DJ in front of me. My DJ journey begins here. I spent the next several months of my physical recovery learning about Djing, beat matching, using different software, different hardware, mixing different genres of music, etc. I dove in to the deepend, and it really helped me to progress through my injuries and depression. In July 2013, a friend booked me to play for her sister’s wedding, and shortly after, a neighbor who often heard me practicing, booked me to play weekly at his venue at International Plaza. I also began networking and working under different mentor djs as I progressed into my DJ career. 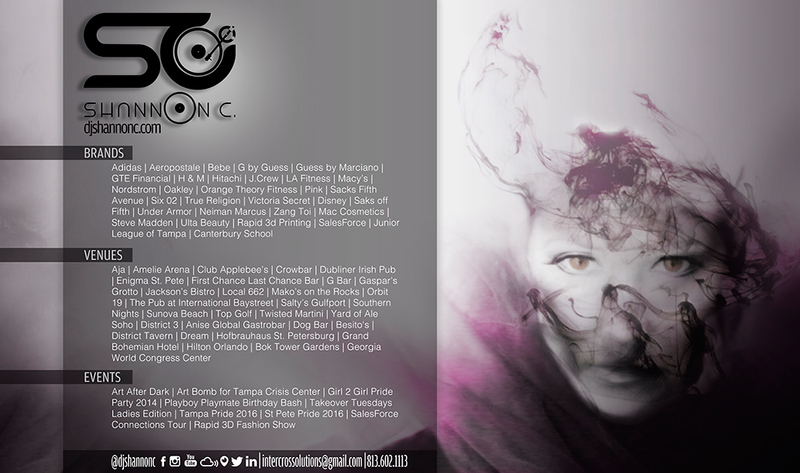 In late 2014 I produced and hosted my first Art and Music showcase to benefit The Tampa Crisis Center, and , I aligned with Scratch Events, an agency in New York City, who began booking me for corporate and fashion brands. In 2015 I began working in nightlife, serving the LGBT community in both Ybor City, and St Petersburg, FL. I also did my first guest set with Jose Da Magician at Art After Dark in South Tampa, and I aligned myself with Trinity Cafe to play music for the homeless on the Holidays. In 2016, I took on my first Out of State gig at the Georgia World Congress Center for the SalesForce connections tour. I began doing guest spots with other local djs including DJ Qeys and DJ Knox at Crowbar for Takeover Tuesdays, and DJ D2 at Top Golf. I did fashion work for Millenia Fashion with With Mall at Millenia and Rapid 3D Print for their 3D Print Fashion Show. I also began teaching DJ lessons to local teens. In 2017, I was invited into my first DJ crew, affectionately gaining the title of the First Woman of the Sinister Syndicate. I also began working for 99 Jamz FM, the Berg with a Weekly Segment called Ladies Take Over Thursdays on the Big Show. In 2018, I’m excited to launch my second company, Digital DJ Youth Academy, which offers one to many classes for youth at the elementary, middle, and high school levels. The classes allow students exposure to DJ culture and music while integrating core skills for each age group including leadership, team building, creativity, individual expression, tolerance and celebration of differences, as well as reinforcing familiarity with numbers and language. My goal is to get kids turned on to music early and show them a path for creating a hobby or even a profitable career in music. I want to use music to help my youth reach their fullest potential both in Djing and in life. Late in 2013 I conceptualized and launched InterCross Entertainment. I was annoyed with the lack of professionalism that I’d experienced on the business side of the entertainment industry. InterCross was born as a way to merge top quality talent with old school service based business practices. I’m here to serve. My company is built on a bedrock of love, compassion, passion for what’s possible, and commitment to providing a top quality experience to everyone we reach. My mission in both my own brand, and in InterCross Entertainment is to help you achieve your best musical experience , be it in the form of an event, collaboration, or education. I’m here to serve you. The best way to stay connected is to become an insider! You’ll get tips for booking djs, updates on new mixes and shows, and behind the decks look at my life as I strive to encourage and inspire the masses through music. 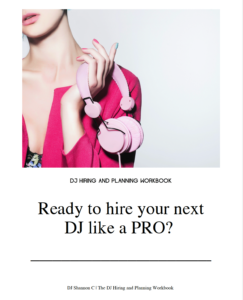 Plus you’ll get a fantastic, FREE Entertainment Planning Workbook to help you manage the entertainment for your next event from Booking to Planning the Event, It’s got everything you need to set your next event up to be a huge success! Thank you so much for taking the time to visit! I’m so happy to connect with you, and look forward to our journey ahead!